Today the Center for History and New Media launches another major software platform that we hope will be of great help to universities, libraries, museums, historians, researchers, and anyone else who would like to put a collection or exhibit online. It’s called Omeka, from the Swahili word meaning “to display or layout goods or wares; to speak out; to spread out; to unpack.” The public beta released today was underwritten by the generosity of the Alfred P. Sloan Foundation and the Institute of Museum and Library Services. As with Zotero, Omeka grew organically out of a strong need that we identified at CHNM over the last decade, as we built a series of projects that presented, and in some cases collected, historical artifacts. 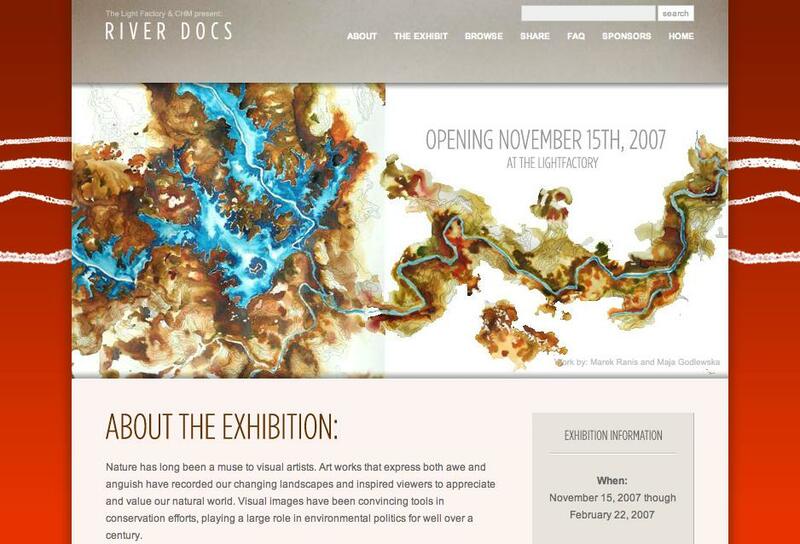 Projects such as the September 11 Digital Archive and associated work with institutions such as the Smithsonian and the Library of Congress made us realize how much work—and how much money—it takes for institutions (and individuals) to mount high-quality and flexible exhibits online, and to manage the underlying collections. Omeka aims to simplify this entire process, save valuable resources, and create a free and open platform that the museum and library community, and anyone else, can enrich to by developing themes and plugins. The 150 institutions already using Omeka as part of our pre-beta, ranging from the small (North Carolina’s The Light Factory and Cultural & Heritage Museums‘ River Docs exhibit) to the large (the New York Public Library) have already responded to the ease-of-use and power of the platform. Adding items is a simple process, but collections conform to library and museum metadata standards, and you can also use tags. The theme-switching process and plugin architecture at the heart of Omeka will be familiar to users who are accustomed to working with popular blogging software, but Omeka includes a number of features that are directed specifically at academic, museum, and library use. First, the system functions using an archive built on a rigorous metadata scheme, allowing it to be interoperable with existing content management systems and all other Omeka installations. 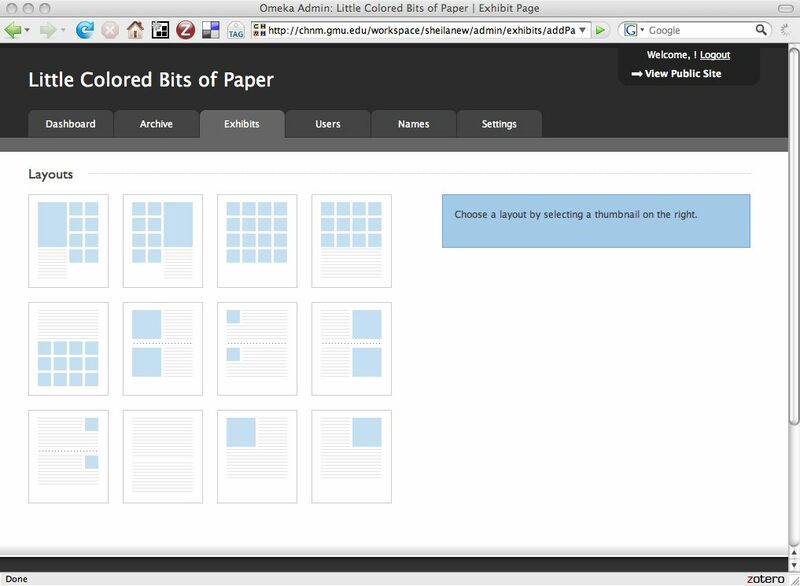 Second, Omeka includes a process for building narrative exhibits with flexible layouts. The layout of your site can be changed with a single click. These two features alone provide cultural institutions with the power to increase their web presence and to showcase the interpretive expertise of curators, archivists, and historians. But Omeka’s plugin architecture also allows users to do much more to extend their exhibits to include maps, timelines, and folksonomies, and it provides the APIs (application programming interfaces) that open-source developers and designers need to add additional functionality to suit their own institutions’ particular needs. In turn, a public plugins and themes directory will allow these community developers to donate their new tools back to the rest of Omeka users. The Omeka team is eager to build a large and robust community of open-source developers around this suite of technologies. You can learn much more about Omeka on its website. 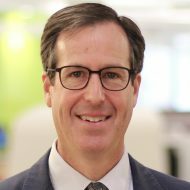 Credit goes to the fantastic Omeka team: directors Tom Scheinfeldt and Sharon Leon; developer and manager Jeremy Boggs; manager Sheila Brennan; and developers Kris Kelly, Dave Lester, Jim Safley, and Jon Lesser. Dan, as a Charlotte native, I have to point out that the Light Factory is in North (not South) Carolina. Geochallenged attributions aside, congratulations to CHNM for another exciting product. First, the metadata support is just a series of flat fields. In a relational database? I would have thought the Zotero experience would have shown the practical limitations of this sort of modeling? Second, this is a familiar issue of mine, but I noticed first/middle/last name columns in one of the tables. I know this is common in (particularly) U.S. based web design, but it’s not very international-friendly. Third: RSS2? I would have thought a new tool like this would have logically supported Atom as default (and perhaps the RDF RSS flavor). Good timing! We’re looking to get away from ContentDM this year as we can no longer afford the licensing fees. This looks great! @Wally: Oops. Thanks for the correction. I think I meant to write Cultural & Heritage Museums of South Carolina. 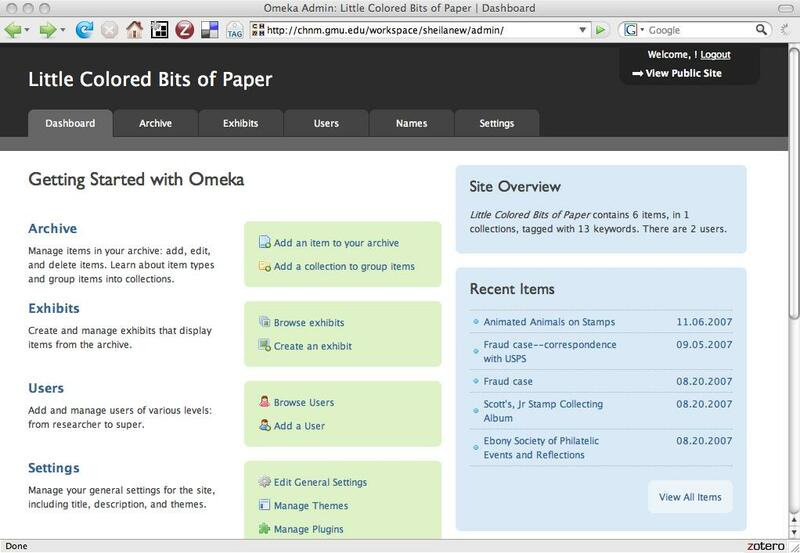 That’s a great idea about using Omeka as an exhibit front end for DSpace. Let the Omeka team know if you need any help. @Bruce: You should raise these issues on the Omeka forums (though I’ll of course forward them to the Omeka team). The Zotero and Omeka teams are completely distinct, and so there perhaps has not been enough cross-pollination. But these seem like things the Omeka team can address quickly. 1) Experience tells us that individuals and small cultural institutions shy away from collection systems that emphasize esoteric schema. 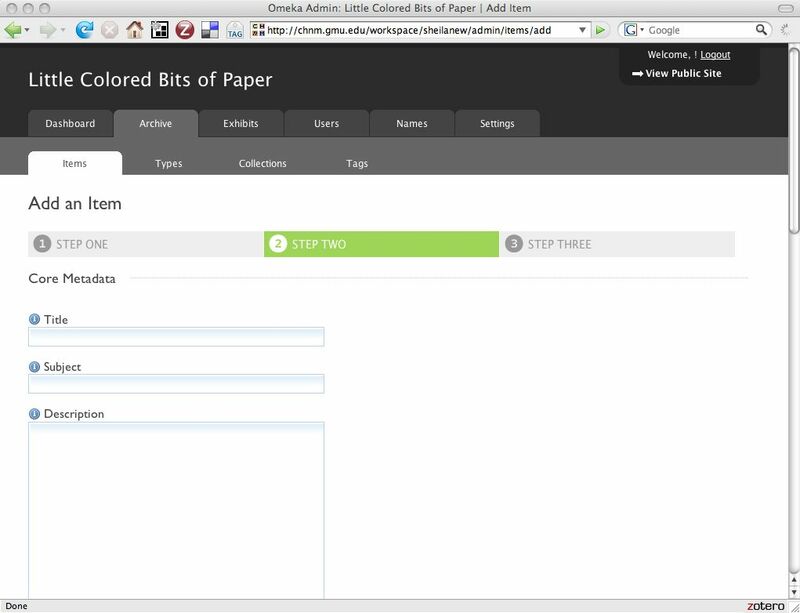 To balance their needs with the needs of advanced users, Omeka offers a generalized, easy-to-use schema that includes a permanent Dublin Core element set (the “flat fields”) that are common to all items, as well as customized item types to which users may assign customized metadata element sets (the “relational” metadata). This way, we feel, the average user will not be overwhelmed by strict metadata standards, while the more advanced users may customize their item types to whatever standards they wish. 2) We agree with you that this is a weakness, and we will be focusing more on localization in the future. 3) We have a ticket on Trac to add an Atom feed. And there is a RDF Dublin Core output that you may not be aware of (using ?output=dc). We intend to add more outputs as time allows. Pingback: theorywatch » Blog Archive » Beta Phi Mu and Omeka too!